Do you live in Tucson or the Southern Arizona area and are Interested in learning how to become a	tennis coach, or, be a better tennis coach? 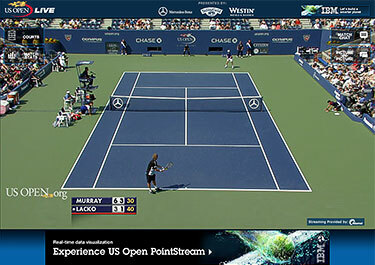 The USTA can assist you with your training. Get a Recreational Coach Workshop started in your area today! Recreational Coach Workshops (RCW) are part of a national training program for people teaching and coaching players at the recreational level. These workshops are an excellent primer for new recreational coaches and instructors as well as a valuable refresher course for those with teaching experience but who seek to learn the latest teaching methods. Each RCW is taught by a specially trained, certified teaching professional (USPTA and/or PTR) the	United States Tennis Association (USTA)	has developed. During a 6-hour workshop, the session will cover; teaching large groups, the games-based approach to coaching, and drills every instructor should know to help teach effective lessons and run team practices. Upon completion of the one-day workshop, attendees will become eligible for an educational membership in the USPTA as a development coach. Attendees will also receive access to the latest in transition ball technology and other materials/resources provided by the USTA. Make your approach to recreational tennis dynamic and fun, and help better train and educate your area's instructors. Check dates and times for the RCW location nearest you on the schedule below. 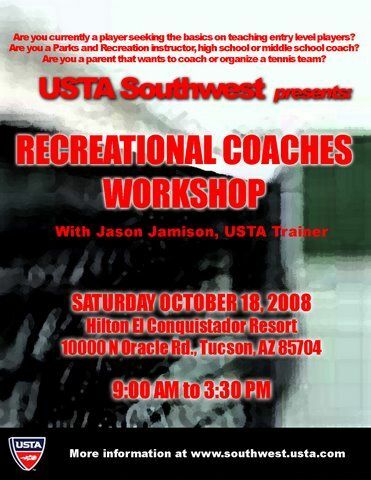 For more information on how to get an RCW started in your area, contact USTA Southern Arizona Tennis Service Representative Keeley Hutchinson (hutchinson@southwest.usta.com) or call (520) 742-9222 to register. Registration Form: Please print out form HERE and send via e-mail to USTA Southwest Tennis Service Representative Keeley Hutchinson (hutchinson@southwest.usta.com), or call (520) 742-9222 to register. *A special focus of this workshop will deal with Adaptive and Wheelchair Tennis.